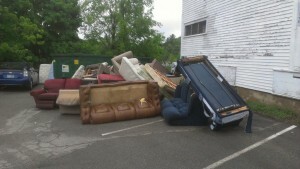 At the end of my freshman year at the University of New Hampshire, I noticed dumpsters overflowing with thousands of usable items thrown out by students who were moving home for the summer. Furniture, electronics, clothing, food, dishware, decorations, school supplies and much more was being sent to local landfills or incinerators. I was appalled. I’d been involved in a few environmental efforts since high school, like working on greening the cafeteria and showing documentaries about climate change and plastic pollution. But I’d never faced an issue as big and complex as this one. How could I, one lone freshman, tackle the massive problem of 100’s of tons of usable materials being sent to the landfill each year? To solve this problem, I helped organize a group of students to start a program called Trash 2 Treasure. We collected thousands of reusable items discarded by students during move-out, stored them over the summer, then held a massive yard sale over move-in weekend. The sale earned more money than it cost to operate, creating the first student-led, self-sustaining program of its kind in the country. In the three years since then, Trash 2 Treasure has diverted over 110 tons of waste and generated over $54,000 in revenue to be used for future sustainable initiatives on campus. After I graduated UNH, my friend Brett and I started a nonprofit called the Post-Landfill Action Network (PLAN) to help bring the Trash 2 Treasure model to other schools. Now, we meet dozens of students who are frustrated with the cycle of campus waste, and want to take action to solve the problem. This year, we are working with students at six schools to launch new move-out waste programs. If you’re ready to tackle this issue at your campus, here are 4 simple steps to get started. I took a bunch of photos and videos of dumpsters overflowing with materials and they were extremely useful tools for organizing around this project. With clear images, everyone was able to understand what the problem was, why it was important, and that we needed to work together to solve it. We’ve put together this 1-page primer “How to Conduct a Move-Out Waste Audit” to get you started! If you’re part of a club on campus already, great! If you’re not, get involved! Most likely your campus has student groups full of students who care about these issues (environmental clubs, social justice groups, Net Impact, etc). Make friends with the members and find out what they’re up to. Maybe they’ve already addressed this issue in the past and you can learn from their experience. Either way, like-minded students are the first place to start. No matter how hard you try, this program will not happen without the permission and support of your university and multiple different departments (usually this includes at least Housing, Res Life, Facilities or Campus Planning or Physical Plant, Sustainability Offices and more). Start by finding an adviser, someone who can support your efforts from Day 1, who can help you make connections and can be a champion for your program behind the scenes. Always go into meetings asking questions. Administrators are very used to students coming in with bright new ideas. Your goal should always be to gather information first, and to work with them to find a solution. Remember: it’s easy for administrators to say “no” to a new project – it takes thought, time, consideration and energy to say “yes”. You have to work with them to find negotiated solutions. We’re here to help. Check out our “Become a Member” page to learn more about membership benefits and what we offer to help your project get off the ground and remain successful and self-sustaining in the years to come! 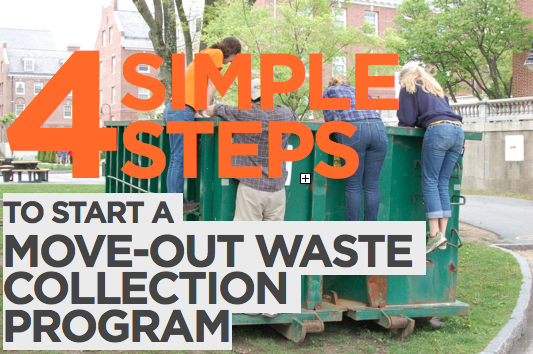 We are exploring a lot of different ways to help campuses reduce waste beyond move-out collection programs, like how to expand compost to other areas of campus, or how to recycle consumer goods like carpets, mattresses, electronics, styrofoam, and more! Shoot us an email if you have any questions and we’d be happy to set up a Skype to learn more about you and your campus and discuss next steps. Cheering PLAN on from here. So cool !!! Feeds my spirit to here of a story like this one. Thanks Alex and others involved in reuse and landfill conservation. Kristine from San Diego area.